Eye On Tampa Bay: Readying for a Referendum? 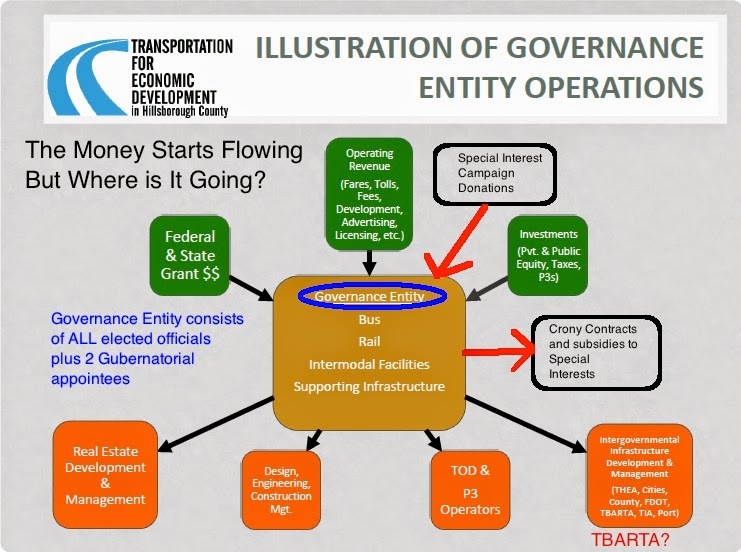 This is Part 2 covering the HART Board Strategic Planning Workshop held Monday, June 9, reporting on the update from the County Administrator on the Hillsborough County Transportation and Economic Development Policy Leadership Group. Below are some slides from County Administrator Mike Merrill's presentation: (click slides to enlarge) with my takeaways. 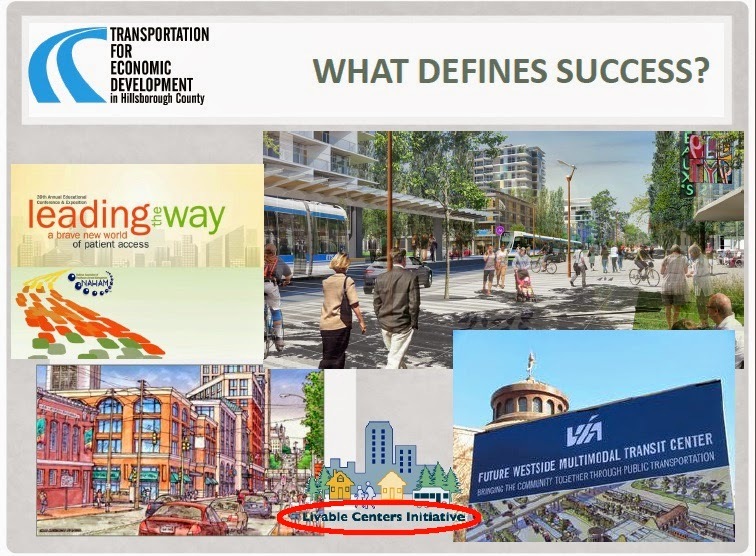 When Merrill showed slide 1 (below), I thought I was looking at a stack and pack city out of the movie Bladerunner not any rendition of downtown Tampa. 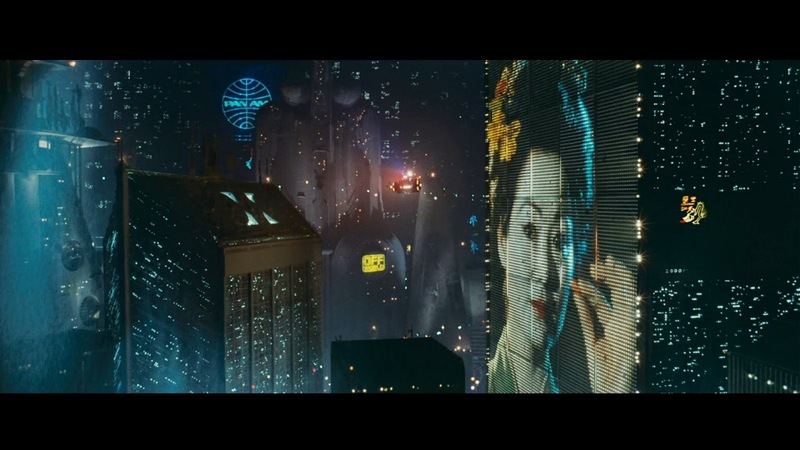 At least Bladerunner had flying cars. Make you wonder why our elected officials want to tie our transportation solutions so closely to land use? Do they want to coerce (force) densification and stack and pack us to pursue their agenda, including more public transit? The plan needs to be consumer driven and multi-modal to force/coerce a cultural change to "get us out of our cars"
It was started in Atlanta in 1999. Livable Centers Initiative encourages local jurisdictions to plan and implement strategies that link transportation improvements with land use development strategies to create sustainable, livable communities consistent with regional development policies. ...non-motorized transport (sidewalks and bike paths) receives most of the resources from LCI grants. ...most of the projects have little to do with transportation. Transportation funds should not support economic development projects. LCI often fails to spur any development. When our politicians complain that roads don't pay for themselves, well, neither, apparently, do "livable centers". What Are We Agreed On? The Policy Leadership Group or who? Who says we "must" attract choice riders and taxpayers must highly subsidize choice riders? Why wouldn't choice riders pay market price? Transportation doesn't pay for itself......but transit is much more highly subsidized than roads. According to this Heritage Foundation article published last year highway user fees supported each transit passenger mile 17 times more than each highway passenger mile ($0.1130 for transit; $0.0067 for highways). According to Merrill, this plan is "something for everyone"
As transit ridership grew over time and we became more transit-centered, we would grow into rail and into a fully functioning multi-modal system. Where's Ride-sharing services like Uber & Lyft, Jitneys, De-regulated Super Shuttle? We will note that roads are multi-modal as vehicles, buses, bikes, pedestrians and even sometimes golf carts use them. Merrill mentioned that the CIT tax "worked well". That was a bit disturbing because the CIT did not deliver what was promised the voters and it was all spent less than halfway through the 30 year life of the tax. There are at least $127-$130 million of projects Merrill stated should have been paid for through the CIT tax but were shelved due to no funding. Merrill stated there will be a comprehensive list of proposed projects at the next Policy Leadership Group meeting on June 26 that will include a BRT demo project, people movers, etc. When asked by a Board member what the BRT demo project was, Merrill didn't answer the question. We'll have to find out more at the June 26 meeting because no details were provided by Merrill about the list of proposed projects. Merrill stated "there is no more capacity in our budget and we cannot move forward without a tax increase". Really? Did he say that on behalf of himself, the County Commissioners or the Policy Leadership Group? The proposed FY 2015 Hillsborough County budget is almost $4 Billion. Are our spending priorities in the right place? Do we have existing assets that could be repurposed to a higher priority like roads? Commissioner Sharpe voiced concern about "the plan" being "road-centric". What plan? There's been no official plan made public but Merrill stated the sales tax increase would probably be a 50/50 split between roads and transit. 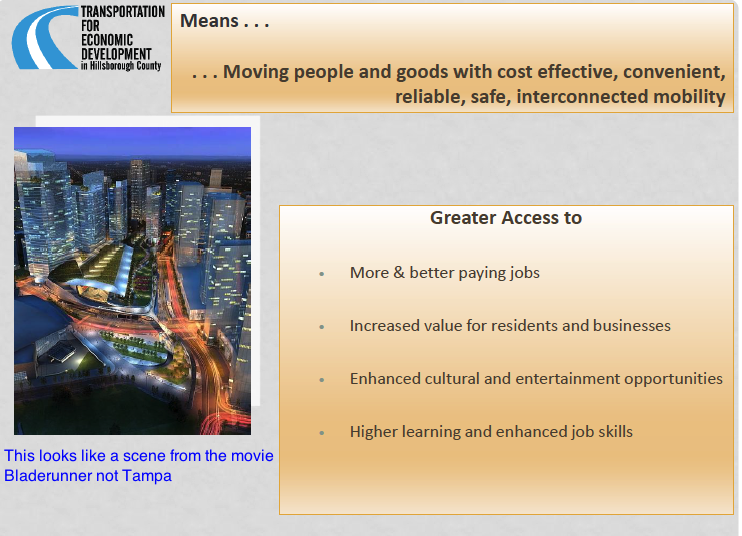 We already spend more money in Hillsborough County for transit than we do on our roads. It is estimated that the county needs approximately $160 million per year to add 200 lane miles of roads every 5 years to keep county roads up with current population growth. The plan must be road-centric! Regarding the hostile takeover vote by the Policy Leadership Group we reported here, there were a number of concerns raised by the existing Board members about the proposed restructuring and re-purposing of HART. Below, with a few edits I added, is the chart Merrill presented that reflects this new Governance entity. This new entity would oversee a huge bucket of money. How will this work considering our strict Sunshine Laws? The biggest risk is our transportation solutions will be politicized which then enables wasteful spending, cronyism and corruption. The money starts flowing but where is it going? In addition, why is money going to TBARTA? That's the same as handing our tax dollars off to part of the rail cartel Tampa Bay Partnership. We did find out that the hostile takeover vote by the Policy Leadership Group was non-binding. Maybe that was why they voted without allowing any opportunity for public comment. The vote didn't actually do anything except provide a perception that it did or serve as a trial balloon. It also appears that the existing HART board would have to vote to make the changes the Transportation Policy Leadership Group is proposing. That would basically mean the existing Board would have to vote to kick most of themselves off the board. Would they? The restructuring and repurposing of HART still remains murky and there are questions that will need answering. Was this the start of a push for a referendum? Was Merrill's presentation a sales pitch that seemed to conveniently coalesce with the new Super Sized expensive HART plan revealed at the beginning of this workshop that we posted about here? But before any referendum is pursued to increase taxes, the county must put our "checkbook online". Then when money starts flowing, taxpayers know where it's going! UPDATE: The June 26th meeting that was going to be about transit and provide a list of transportation projects has been postponed to August 21st. We must always make sure the bulk of the money will go to roads, since the majority of the people will continue to use the roads in their private vehicles over public transit, as well as commercial truckers. We must address this issue realistically, and always consider the cost.